Members of the Thomas family gather around the tribute to the late Bill Thomas. 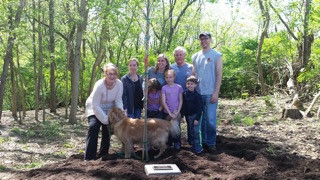 As part of the city wide Ignite the Parks and Arbor Day celebrations, the city paid tribute to Bill Thomas by planting a tree in his memory at the head of the Landmark Tree Trail. 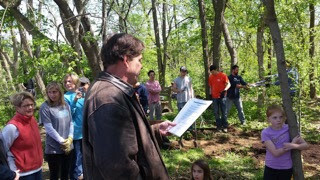 The group of volunteer workers were enthusiastic about removing invasive species as well as dedicating the trail to the man who established it. And that is how it started and the enthusiasm grew from there. In addition to their work, the Tree Commission distributed native tree saplings to plant in yards. Bill Thomas began the arduous task to map out prominent trees and later created the Landmark Tree Trail. He secured easements, organized volunteers, and brought the tree tail to fruition. Bill was also one of the founding members of the Fort Thomas Forest Conservancy, publisher of Inside Fort Thomas (later called Inside), editor of Fort Thomas Living, and author of a few books about Fort Thomas. The Landmark Tree Trail is located near the entrance to Carmel Manor and is home to some of the largest and oldest trees in the city. Mayor Haas reads a proclamation.